Tell that to the City of Chicago and the upper midwest. Tell it to the UK. The story as it was originally told seems prescient now. It looks now like cooling of the upper atmosphere can create cooling down below. It is, at least, a plausible explanation for the repeated polar vortices in the last few years. It is quite possible that greenhouse gases are trapping in heat at the same time the sun is reducing its radiation and that the sun may be winning that battle for the time being. Most of us recognized from our own experience that the earth felt like it was getting warmer in the seventies and eighties and nineties, and we could see that glaciers were retreating rapidly. Now many of us feel by our same experience that the earth is actually cooling. We have had a repeated harsh winters of late with each one feeling more severe than the one before. 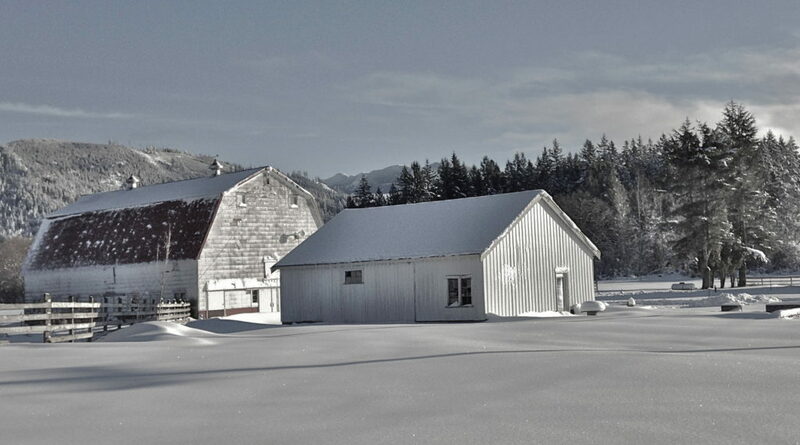 As I write now, the edge of the polar vortex has made its way to the Pacific Northwest, and snow is blowing sideways across the fields from the north. The wind is howling around the house and knocked the power out so that we were running on generator. 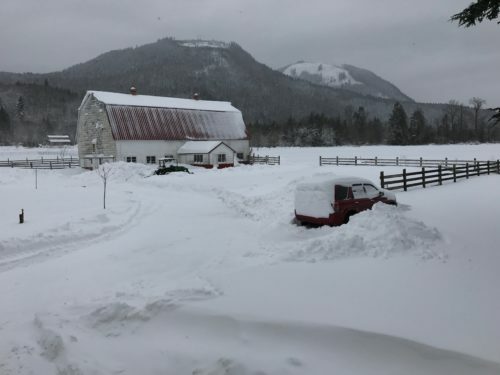 That’s not unusual for the mountain region where I live, but for the last three years winters have brought record snowfalls to parts of the Cascades. So, what is normal? Can the earth be cooling when there are clearly more greenhouse gases now than back in the 1700s? It is cooling because the sun is going into a mini ice age event called a solar minimum in which the sun stops emitting solar flares, which means it stops bathing the earth’s outer atmosphere in as much ejected radiation (and the heat that goes along with that). The last time the sun settled into one of these reduced-activity cycles was back in the late 1600s and 1700s. Benjamin Franklin was visiting France in those days, and the United States of America did not exist. That the earth was cooler in those decades of reduced solar flares is born out by numerous writings that talked about how the Thames would freeze over and other great winter-storm events. It is also recorded in trapped atmosphere in which trace particles indicate a cooler climate at that time. Do winters like this one and the possibility of decades of solar quietude mean greenhouse gases won’t cause global warming? I think an objective view, free of political wishes, would be that it simply means greenhouse gases are not the sole determining factor in the earth’s temperature. Surprise! The sun is also a factor in the earth’s temperature, and the sun’s emission of energy changes on a about a 300-year cycle, which means the earth is likely to cool for the next fifty to one-hundred years, despite greenhouse gases. It may not cool as much as it did in the 1600s, thanks to greenhouse gases. We may be glad in the short-term that we have a blanket of greenhouse gases to keep us warm. At the same time, it will not be wise to squander the opportunity this gives us to set things right at a rate that is not economically destructive because it also means the solar minimum will end; the sun will start slowly moving back toward a high level of solar flares, and global warming will become even more serious than it was in the cycle we just completed if we accumulate more of those gases during the minimum. From what I have seen of our nation’s deficit spending, it seems to be the pattern of this generation not to care about the generations that will follow. From what I see of how we create nuclear waste that tens of generations will have to manage at great cost and no benefit and considerable risk just so we can have a few decades of cheap electricity now, this generation does not care about those that will follow. I hope we will be rational in the years ahead about what the two facts of solar minimums and greenhouse gases mean and choose a pragmatic course of action. The best plan might be to not put reduction of greenhouse gas production radically ahead of immediate economic needs as we go into the long minimum that lies before us when we’ll be glad for any blanket we have but to keep our entrepreneurial focus on moving toward a global economy that reduces such gases as we climb out of the minimum. That is what I think we would do if we do not act out of global-warming hysteria or scientific dogmatism but out of rational assessment of the scientific facts. The solar minimum may buy us time to reduce our production of greenhouse gases and to reduce our dependence in a way that does not cause huge negative economic impacts. At the same time, moving toward an ever greener world is a goal that can drive economic innovation. While I remember a long part of my life when summers and winters felt continually warmer, I also remember a time in my youth when waves did not splash clean and sparkling on the beach, but glopped onto the beach as black sludge and when the air in my home town was brown. We’ve come a long way since the Clean Air and Clean Water acts and the days when rivers caught fire. I’ve no desire to return to that world. Right now, the sun’s calm is likely the reason the rise in surface temperatures on earth has slowed way down. We are not even fully into the minimum period, and you can expect the temperature drop to continue to worsen even after the bottom of the minimum has past, which won’t be for, at least, another fifty years. Temperatures will drop past that point for the same reason temperatures in winter continue to drop for two months past the shortest days on the calendar. It takes awhile for our exposure to the sun’s radiation to go back up enough to where it starts warming the earth again. The bottom of the Little Ice Age lasted from about 1645 to 1715. It was the deep-cold part of a cooling period where solar flares started to decline in about the year 1600, reached their minimum around the year 1700 and then began to rise again, reaching a new peak around 1775 and again in the 1950s. Solar minimums going back in time from the 1950’s peak. The bottom of this period is scientifically referred to as the Maunder Minimum, named after scientists Edward and Annie Maunder, who observed only 50 sunspots (which result from solar flares) over a 28-year period at the bottom of that cycle. That contrasts to about 50,000 during an equal time period when the sun is at its solar maximum. It seems reasonable to infer that such a huge difference in how much radiation bathes the earth, creating auroras and energizing the earth, is going to have some effect on global temperatures. A number of scientists believe the solar minimum has, at least, a minor effect on the average global temperature between the highs and lows of those cycles, so the idea that it can be part of a mini ice age is far from fake news. I remember first reading about the idea being put forward by a mathematician in my home town two decades ago, and I found his belief, which was heretical at the time, to make a lot of sense. I’ve believed it ever since, and now that we can finally measure its actual effect on the earth’s thermosphere and feel the polar vortex descending further south each winter, I find the idea has even more credibility and is, at last, regularly appearing in numerous publications. However, old schools of thought don’t give way easily to heretical ideas that are politically incorrect — not even new, old schools of thought. Neither, on the other hand, does the self-serving human nature that believes what it wants to believe so that it can have all that it wants to have without regard for future generations. I’d like to think we can be more reasonable than either of those extremes and just weigh the evidence. Different scientists draw different conclusions about how much the Maunder Minimum was caused by the diminishing solar cycle and how much was from volcanic eruptions, but we now know for certain that solar minimums cool the outer atmosphere where volcanic eruptions have little effect, and we know that each of the minimums shown in the graph above is associated with a period of cooling on the earth, while the Medieval solar maximum was a notably warm period just like the one we recently experienced. 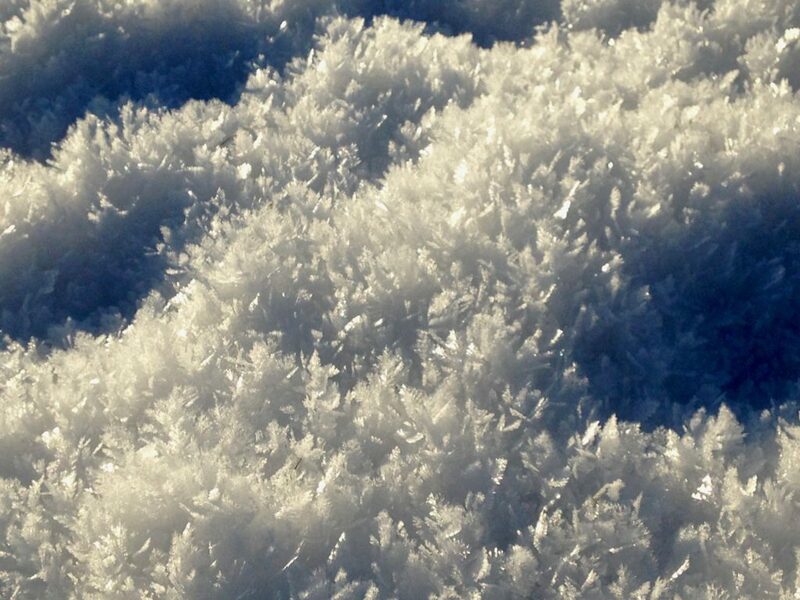 Snow crystals on our lawn grown like feathers after weeks of continuous frost.